Campaigners against the Albany and Linn County bans on recreational pot commerce whoop it up at Ellsworth and Fourth Wednesday afternoon. If campaign money was the only thing that counted, supporters of commerce in recreational marijuana in Albany would have an astronomical advantage. But cash is not the only thing that counts. The campaign committee against Albany Ballot Measure 22-156 has collected more than $67,000 in cash, almost all of it from the same marijuana entrepreneur who has companies in Boulder, Colo. On the other side, until recently there was no campaign committee in favor of the measure. But on Oct. 24, Albany Mayor Sharon Konopa reactivated a long-standing committee she heads as treasurer. Its purpose used to be backing tax levies to support the police and fire departments. Now it supports Measure 22-156, the city council’s ban on the growing, processing, wholesaling or retailing of recreational marijuana within the city. As of Wednesday, Konopa’s committee listed only some in-kind campaign work from her. Its contributions and cash balance so far? Zero. So in the campaign finance derby, the pro-marijuana side is leading the other side by about 67,000 to nil. And on Wednesday it still had a balance of $24,000-plus. A council member asked me Wednesday how I thought the Nov. 8 vote on continuing the Albany ban on recreational marijuana stores would come out. Based on the Albany vote on statewide Ballot Measure 91 in 2014, my guess is that the ban will be overturned. But I don’t think the money being spent for the cause (including a couple of recent $1,000 contributions from individuals in Corvallis and Wilsonville) has much to do with it. Instead, I think the proportion of tradition-minded voters in town has been shrinking in comparison to those for whom recreational marijuana use is no big deal. I am very anti-drug, having seen what it does to family members and friends first hand. Drugs ruin lives, minds, and bodies. Drugs have killed young adults in my life, and ravished others. Drug use tears apart societyl, financially and socially. Yet, I also see that the never-ending war on drugs has had limited impact. I believe the glamorization and embrace of drug use by film and music artists is difficult to overcome. Education is the answer, real eduction, more than just public service announcements. I believe in a social and financial commitment to help those who have succumbed but now want to stop. However II will vote no on these measures as well. This in no way means that I encourage the use of drugs. Similarly, I discourage cigarette use, but would be against a ban on the sale of cigarettes in Albany. The prohibition of the past 50 years has failed, needs to be discontinued, and better methods used to discourage drug use. I do hope you are correct in your prognostication about the outcome. I honestly believe you’re spot-on with “why.” The sky hasn’t fallen in communities that have allowed it, nor will it in Albany. We will *gain* tax revenue from the state to help educate & enforce the state rules around use of cannabis. However, I’m very-very proud that I’ve been able to instigate a PAC, garner support, and (I hope) help run a more effective campaign to reinforce the M91 vote. My reaction is sort of a yawn and “meh” to this post. The one interesting nugget is the mayor’s little chess move. Curious. Wondering why she reactivated the committee? Perhaps she reads this. I’ll ask her myself. Ms. Konopa, why the internal drive to fight so hard on this issue? As a woman, I think the mayor has a rather Pollyannish perspective on this issue. Because the mayor has been so deeply involved in Albany politics for so long, one might think she ought to have grown far more pragmatic. But this issue with the marijuana seems to be very personal for the mayor. Her twitchiness is discomforting. Her over-reaction to this singular item makes it so. While the mayor is entitled to her opinion and to her tie-breaker vote, she should remember who put her in office. to all you potheads—60 minutes tv program just did a mayor story about use of the drug in Colorado. Illegal growers were busted 1-2 times per year before rec drug approval–now it is 70x per year. It has attracted Asian drug cartel illegal activity. New born babies with thc in their bodies is now epidemic–those babies will have diminished mental capabilities for their whole lives. A whole generation will be lost –and we think graduation rates are poor now. Colorado’s governor says go slow and collect the data as we go–DUI’s/suicides/newborn addicts/incarceration rates. I hope law and medical professionals will step-up and report the data on a regular basis. The two city council potheads are leading the downward spiral of the city/nation. Your bloviating does nothing to improve the quality of discourse. Your fearmongering does nothing but mislead. Your overreaching demonstrates that your finger isn’t exactly on the facts. But these shortcomings have never stopped you from demonstrating your ignorance before, so why start now. I have to say as someone living on Hwy 20 (Corvallis side) that I’m all for reducing impaired drivers (of which there seem to be an increase :/) in any way possible. 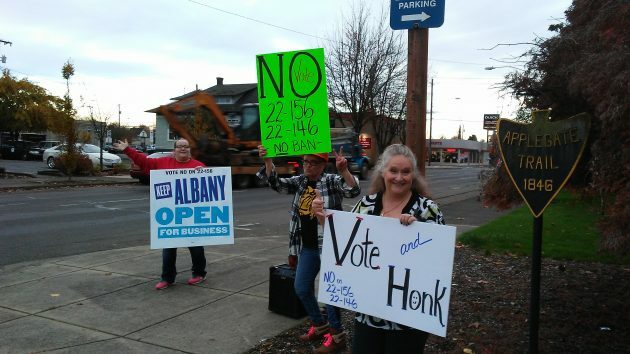 I only recently that Albany’s ban might be related, as I drove through town (spend a lot of time in Albany) and wondered why I wasn’t seeing any new pot shop signs. I think there are 3-4 new ones already open in Corvallis and plans for more. That’s a lot of business, and taxes, and possibly impaired driving. The two towns are too close for one to have a ban that the other doesn’t IMO. Oregon (and it’s rules are light years ahead of Colorado – because of the information gleaned from Colorado (and Washington). I also note the OLCC saying that as of 11/16, all taxes from cannabis can be paid online. Will be no more need to have caravans of cash going up/down I-5. Oh – I also love Tom calling me a “pothead.” Inasmuch as I have not partaken in anything for almost 50 years, I take that as compliment akin to getting an honorary degree. As opposed to the hatchet-job on 60 minutes, here is a decent CBS Sunday Morning News segment (this morning) about cannabis on the ballot… It starts in Portland, OR.